Kinzo Kato, a goldfish merchant in Yokohama City, Tokyo, made the Calico Oranda in 1943 by cross-breeding the Oranda and the Calico Telescope. It was named ‘東錦’ (Azumanishiki) by goldfish merchant, Tetsujiro Takahashi, in reference to the land of origin ‘東京’ (Tokyo). Its body shape is the same as the Oranda, and its body color is the same as the Calico Telescope. The Calico Oranda has obvious characteristics of being a cross-bred species based on appearance alone. These characteristics include developed lumps, long tail fins, a well-balanced body color of red and blue with black and mosaic-like transparent scales. Whenit has a great red lump on its head, its value is higher. Acquisition difficulties Normal. The Calico Oranda has been very popular for a long time and there are many Calico Oranda lovers and societies across Japan. This kind of goldfish is a major variety along with the Wakin, the Ryukin and the Oranda, so acquisition is relatively easy. Rearing difficulties Somewhat difficult. In contrast to acquisition is which is relatively easy, they are a weak species. However, as long as basic rearing rules are followed, they do not die easily. Details of the above photo The goldfish in the picture is a Calico Oranda considered to be a product of Nagasu, Kumamoto Prefecture. It was displayed at the special goldfish exhibition at Kagoshima aquarium. It has a great physique and unique features. 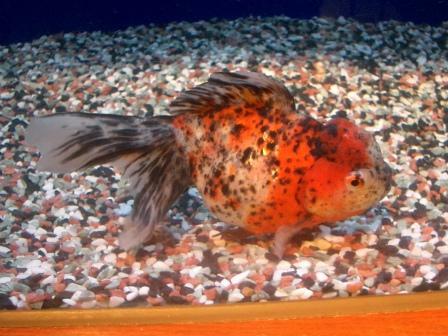 Other It is called the ‘Calico Oranda’ in English, however, this is not a common name in Japan. As it is widely known as a part of the Calico Oranda brand, there is a goldfish called the ‘Suzuki Azuma’ that is produced at the Suzuki Fish Farm in Saitama Prefecture. In order to make the Suzuki Azuma, the Calico Oranda is cross-bred with the Hamanishiki.